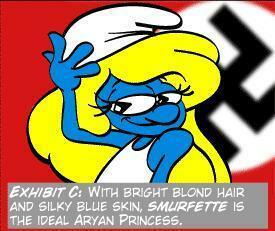 smurfs. . Wallpaper and background images in the Picks club tagged: funny smurfs evil image nazi. This Picks photo contains ڈاؤن لوڈ ہونے والے, مزاحیہ کتاب, منگا, کارٹون, ہالی ووڈ, and کامک بُک. Debs, you're more obsessed than me. I'd be worried if I wasn't in full agreement.